My Raspberry Pi 3 Wi-Fi isn’t very reliable even after disabling power management my RPI still manages to lose connection to my Wi-Fi router and i don’t have any keyboard or screen connected to it and its not advisable to do hard reset i.e unplug the power as it may corrupt your SD card. I’m going to cover writing a short script that Auto Reconnect WiFi on Raspberry Pi to a Wi-Fi network. The script will run as cron job at around 5 minutes interval to check if the Pi has network connectivity and if it is offline, restart the wireless interface to bring it back online. There are a few ways to determine if the Raspberry Pi has Wi-Fi network connectivity. I’ll be using ping to determine Wi-Fi connection status. First we need to determine if the Raspberry Pi is connected to the Wi-Fi network. To do this, we can ping a our Wi-Fi router if you want to test internet connectivity you can use google DNS IP address 8.8.8.8 instead but we only want to check connection to our Wi-Fi router. If Raspberry Pi receives a ping response from the Wi-Fi router then we have network connectivity. If the we don’t get any response then we’ll turn wlan0 off and back on. Copy and paste following script and save it (check_wifi.sh) i have all my cron schedules scripts saved under /var/www/cron you can save it to anywhere you like. echo " _____ _ _ _ "
echo " | __ \ (_) | | | | "
echo " | |__) | _ | |__| | ___ _ __ ___ ___ "
echo " | ___/ | | | __ | / _ \ | |_ \_ \ / _ \ "
echo " | | | | | | | | | (_) | | | | | | | | __/"
echo " |_| |_| |_| |_| \___/ |_| |_| |_| \___|"
echo " S M A R T H E A T I N G C O N T R O L "
echo "* PiHome is Raspberry Pi based Central Heating Control systems. It runs *"
echo "* from web interface and it comes with ABSOLUTELY NO WARRANTY, to the *"
echo "* extent permitted by applicable law. I take no responsibility for any *"
echo "* loss or damage to you or your property. 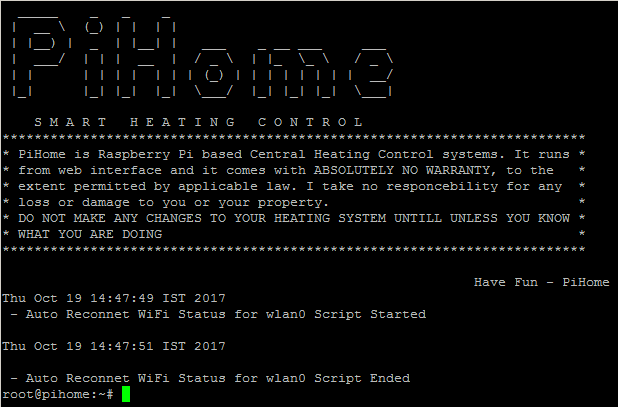 *"
echo "* DO NOT MAKE ANY CHANGES TO YOUR HEATING SYSTEM UNTIL UNLESS YOU KNOW *"
echo "* WHAT YOU ARE DOING *"
echo " Have Fun - PiHome"
# Only send two pings, sending output to /dev/null as we don't want to fill logs on our sd card. First run following command to test there are not errors in your script. After successful execution of Auto Reconnecting Wi-Fi script you should get output as below. Lets add Auto Reconnecting Wi-Fi script to cron schedule so this script runs every five minutes. run crontab -e command and add following line to your crontab, make sure you add >/dev/null 2>&1 otherwise you will end up burning your SD card with unnecessary logs. Lets do more testing taking down wlan0 and let script to restart Wi-Fi. Note: running following command will immediately disconnect your shell session. and you have to wait for cron job to start your Wi-Fi it shouldn’t take more then 5 minutes. After waiting for cron job to run auto reconnecting Wi-Fi script you can try to ssh to your raspberry pi. Assuming everything worked as it should your raspberry pi should reconnect to Wi-Fi. You can adjust time of script to what ever you value you like. Hi Garey, glade this post helped you, i had similar issue with raspberry pi wifi setup each time i want to change my wifi password i have to go back and change password in pi first then change password of my wifi router. i m working on on script to make pi as access point when no wifi is available but there are some dependencies i.e. not all wifi dongle are support to act as wifi access point but its work in progress and i’ll update here once i have something working…. do you have wifi configured? your WiFi connected? it might be wlan1 interface try this and me know. Do you’ve got any idea why it isn’t working? can you try to add following line to your crontab, and mke sure you are logged in as root so all cron jobs run as root. this line will create log and save it to /usr/local/bin/reboot_wifi.log once you have log file you can share here to get some suggestions. did you change gateway=’192.168.99.1′ variable to your router ip address? Yes like I said bevor. If I run the test “sudo ifdown –force wlan0” everything is working fine..
and what you see there ? now clear log file and let it run in cron and compare the output, i just trying to get picture why its not working. So you have also no idea where the problem lies?